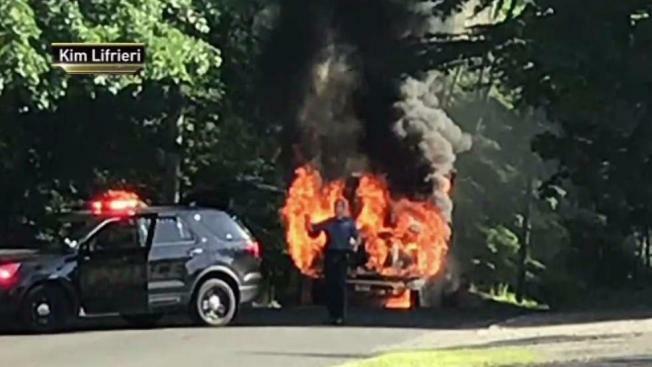 A school bus caught fire and became engulfed in flames while on a route to school in New Jersey Tuesday morning, police say. The bus, which was headed to Joyce Kilmer Elementary School in Mahwah, had just picked up its first student, 11-year-old Rocco Arcese, when Arcese alerted the driver to the smell of smoke. "I was like, 'We should get off," Arcese told News 4. Flames quickly spread and engulfed the entire bus within minutes, ravaging the entire front of the bus and burning the seats inside. "I saw burning rubber falling from the bottom, and flames," Arcese said. The driver and the boy quickly got off the bus, and responding firefighters knocked out the blaze. No injuries were reported. As soon as they were safe, Arcese called his mother, who at first didn't believe him. Then her son's cool demeanor helped calm her nerves, she said. "He's such a calm kid, and I knew he was OK," Stacy-Perone Arcese, Rocco's mother, said. "And I was OK 'cause I knew he'd be OK."
Arcese said it's not the first time he smelled smoke on a bus. His mother hopes it's the last. "I think they all maybe need to be revamped in some way, shape or form," she said. The fire is believed to have been caused by a mechanical problem, according to the fire chief. It wasn't the only scare involving a school bus across the Tri-State on Tuesday morning. Five elementary age children were taken to a hospital with minor injuries after their mini school bus careened into a house on Long Island. The school bus driver was also hospitalized. The cause of the crash in Amityville was under investigation.